As a band led by the multi-instrumentalist and multi-talented Kelly Pratt, Team B is more than just the sum of its members’ many other groups (Beirut, Arcade Fire, Antibalas, etc). The collective group is a means by which performers who are supporting players in their “big” bands can stretch out and take a step to the front of the stage. Last Saturday at the Backyard Brunch concert series, their brief set highlighted Pratt’s vocals along with his trumpet work which has been a mainstay of Beirut sets. The interplay between horns, accordian and dual ukeleles showcased the many talents of Team B while the song selections, which include lyrics adapted from the poems of Theodore Roethke, also showed a literary side. 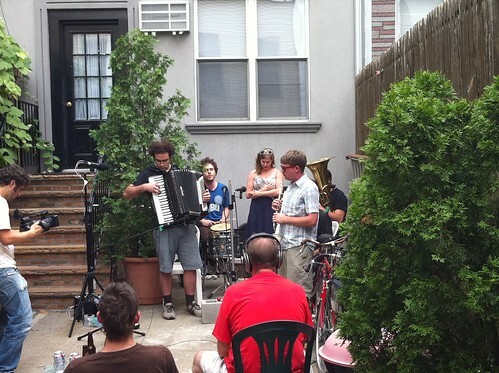 We recorded this set with eight high-end microphones placed strategically around the band. While the mix is not perfect, it does accurately describe the sound in the backyard that day. Enjoy! 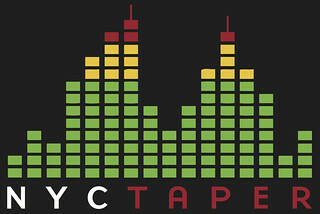 If you email nyctaper for access to this recording, we expect that you will PLEASE SUPPORT Team B, visit their website, visit their MySpace page, and purchase their releases from their main page. another successful show! thanks for supporting my backyard endeavors.